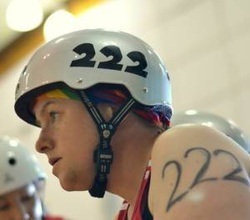 Mistress Munted - 222 - Christchurch Roller Derby. Strong City. Stronger Skaters. Solo parenthood, while maintaining my career and fitting my Derby family into all of it. The love that ORDL has for each other is unlike any other league. Buddy from Dinosaur Train - I have total respect for the will power it must take for that little guy not to eat his Pteranodon siblings every episode (anyone with a toddler will understand this). I am rhythmically challenged, you don't want to see this booty move!! Me and my Bazooka will take on that mother-plucker duck anytime.